It appears the device won't have a front-facing camera for Duo calls. On October 9th, Google will reveal its latest hardware lineup. Rumors have spread for some time that the company is preparing to unveil a smart display at the event, and a leak unearthed by MySmartPrice corroborates the existence of the device, indicating that it will be called Home Hub. Meanwhile, a separate leak of a retail listing suggests the smart display will cost $149, according to Android Authority. The Home Hub appears to have a seven-inch screen and apes the design of Google's other smart home products such as Google Home Max and Mini. The Google Assistant-powered device is said to weigh just 480 grams, which as the same as Google Home. Home Hub may be available in charcoal as well as the chalk finish in the leaked images. Along with time, weather and transit information, you'll likely be able to use Home Hub to view Nest Cam footage and access Google Photos. On the back of the display, there's a physical switch to turn off the microphones. However, it seems there won't be a front-facing camera for you to have Duo calls with your friends and family. The lack of a camera and the relatively small screen could be a factor in helping Google keep the cost lower than competitors such as the $199 Lenovo Smart Display and the $250 JBL Link View. 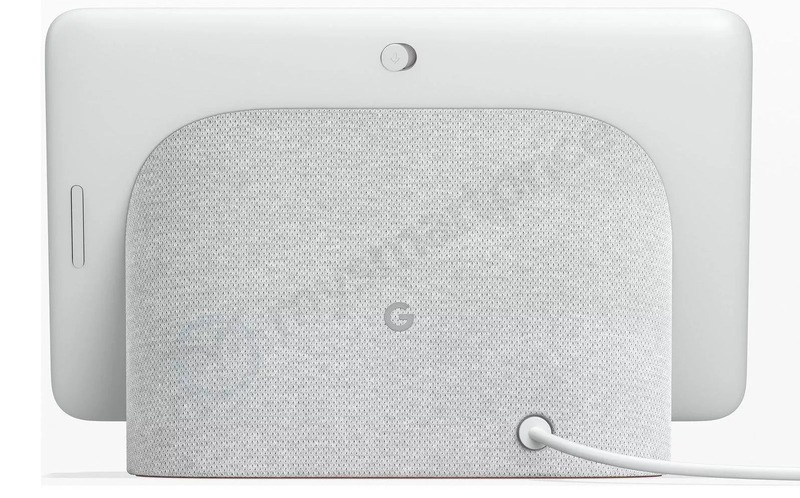 We'll likely find out more details about Home Hub at Google's fall hardware event next month, at which the company is also expected to reveal its Pixel 3 phones.